Since Congress has not yet fielded any candidate from the Lucknow constituency, it’s anticipated that it may likely extend tacit support to Poonam Sinha, who would also get support from BSP, which has formed a “mahagathbandhan” with the Samajwadi Party and Rashtriya Janata Dal (RLD) to jointly fight the saffron party in the elections. 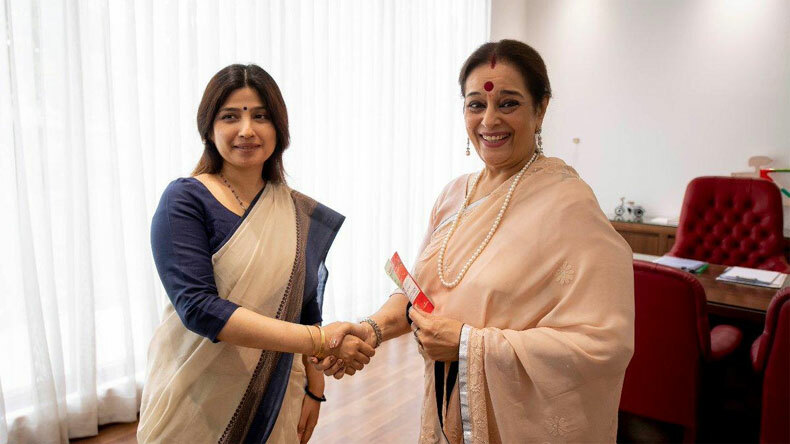 Poonam Sinha, wife of actor-politician Shatrughan Sinha, on Tuesday joined the Samajwadi Party in the presence of party MP Dimple Yadav in Lucknow. Samajwadi Party leader Ravidas Mehrotra said Poonam Sinha will be the candidate of SP-BSP-RLD combine from Lucknow. She’s expected to file her nomination on April 18. Mehrotra has appealed to Congress not to field a candidate from Lucknow so that BJP can be defeated. Welcoming her into the party fold, Samajwadi Party on its Twitter handle wished her all the best. Her husband Shatrughan Sinha himself had switched sides from BJP to Congress recently ahead of the elections. Sinha will contest against Union Home Minister Rajnath Singh from the Lucknow seat. Singh had filed his nomination on Tuesday. Since Congress has not yet fielded any candidate from the Lucknow constituency, it’s anticipated that it may likely extend tacit support to Poonam Sinha, who would also get support from BSP, which has formed a “mahagathbandhan” with the Akhilesh Yadav-led Samajwadi Party and Rashtriya Janata Dal (RLD) to jointly fight the saffron party in the elections. Congress has nominated Shatrughan Sinha from the Patna Sahib constituency. On Saturday, Sinha had criticised BJP claim that the seat has been its stronghold, saying that the voters of Patna Sahib would teach the saffron party a lesson. The actor-turned-politician is seeking re-election for the third straight time from the prestigious seat and will fight against Union Law Minister and four-term Rajya Sabha member Ravi Shankar Prasad. While Sinha himself had served two terms in the Rajya Sabha, Prasad will contest the Lok Sabha elections for the first time. The Bollywood actor had joined Congress last week after he remained sidelined in the saffron party since the 2015 Bihar assembly polls. Shatrughan Sinha was given a rousing welcome at the Congress headquarters in Patna on Friday. Addressing the party gathering, he expressed confidence that he would retain the seat for the third time. Sinha had defeated Bhojpuri actor and Congress nominee Kunal in the 2014 elections in a BJP ticket. Of the six assembly constituencies under the Patna Sahib Lok Sabha segment, five are held by BJP at and a lone seat is held by RJD.